Cold Pursuit looked like another sure-fire hit in Neeson’s catalog of movies. This film looked similar to the Taken movies or The Commuter. While similar to these movies, something is missing from Neeson’s latest film. I walked out of the theater feeling a bit let down. Talking to other filmgoers, they felt the same sense that something was missing. Do you know what wasn’t missing from Cold Pursuit? Reel Leadership lessons! Yes, Cold Pursuit may not deliver a well-crafted movie but it did deliver plenty of leadership lessons you will take away from the movie. This Oscar Wilde quote was shown at the beginning of Cold Pursuit. It’s a fitting quote for the movie and for leadership. In Cold Pursuit, this quote applied to the men Nels dispatched throughout the film. Their disappearance brought happiness to Nels and, most likely, to those they bothered. All of the men that “left” were bad men. They caused plenty of pain to those around them. But how can this Oscar Wilde quote apply to leadership? There are leaders who cause happiness wherever they go. These are good leaders. They know how to make people feel welcome and appreciated. They know happy people work better. Then there are bad leaders. These bad leaders bring happiness whenever they leave. They rule with an authoritarian fist and believe they have all the answers. When these bad leaders go, people discover happiness again. Nels Coxman was honored for his good work and being an example of a good citizen in the resort town of Kehoe, Colorado. They saw the great work he did as a snowplow driver who kept people safe and the traffic flowing. While he also had a little something going on the side, the city could see the good he did. They chose to recognize him because of the good work he did. Do you honor and appreciate the good employees in your organization? Do you call to attention the good work that is done? It is quite easy to do this. It is also a great addition to your organization. Organizations often see increased individual productivity, greater employee satisfaction, higher loyalty, enhanced teamwork, and much more. If you haven’t implemented an employee recognition program, it is time for you to do so. The benefits are many and you will reap the rewards of recognizing your employees. When Nels was accepting his award for Citizen Of The Year, he told the audience he really didn’t deserve the award. His work was simple. He was doing what anyone else would do. This may be true. His work was simple and he did what anyone else would do. But isn’t this what would make for a good citizen? Nels wasn’t willing to boast in his good deeds. Others were. This was Nels being humble. Some leaders love to toot their horn or hear others sing of their praise. They thrive on knowing others see and appreciate what they’re doing. Yet great leaders don’t need to hear their good works praised. They lead not because they have to but because they know leading well is the right thing to do. When someone sings your praise, don’t grow a big head. Stay humble. Accept the praise and continue leading. One of Kyle’s coworkers, a man named Dante (Wesley MacInnes), had stolen a bag of cocaine. This led to the death of Kyle. The sad part is, Kyle wasn’t involved in the theft. He was an innocent bystander who got caught in mess Dante made. Kyle was affected by the choice Dante made. Everything you do as a leader will affect the people you lead. Your choices while benefit or hurt them. It is your choice. The better choices you make, the more positively your choices will affect your team. Make bad choices and your team will be negatively affected. The police originally ruled Kyle’s death an overdose by heroin. Nels wouldn’t believe his son had become a drug addict. He knew him better than this. This caused him to look for answers. He listened to Dante’s retelling of Kyle’s death. Then he went after the bad guys and began questioning them. Nels’ question in Cold Pursuit is a great question to ask your team, especially when things go sideways. Asking “Tell me what happened” allows your team members to share their experience and how they viewed the situation. “Tell me what happened” is also an inviting question. You’re not accusing anyone. You’re asking them to share what they saw. This opens up the freedom to share. Use great questions when trying to get to the bottom of a problem. You’ll get further with the right questions. As Nels began his search for the person who ordered Kyle’s murder, he started at the bottom. The first thug he questioned was Speedo (Michael Eklund). This led to the questioning of Limbo (Bradley Stryker). Which led Nels to Santa (Michael Adamthwaite). Eventually, Nels worked his way to the head honcho Viking. You may rise up the ranks of leadership. You may even think you’ve reached the top leadership position available. The truth is, there’s always someone above you. Even at the top of an organization, there’s someone you will answer to. This could be a board of directors or an investor. You’re never truly at the top. Don’t think you are. Santa was driving through a mountain of snow when Nels drove up behind him in his snowplow. Nels then pulled into a turnaround and Santa believed he was safe. His feeling of safety was short-lived when Nels appeared coming straight for him. This had to be terrifying for Santa to realize Nels was waiting for him. You may feel lulled into a sense of safety as you lead. You may believe you’re comfortable and okay. Then you realize something is still out there. Another shoe is waiting to drop. This is the truth. There’s always another problem to solve or another relationship to mend. A leaders’ job is never done. There’s something around the corner. Sometimes loyalty comes at a cost. Mustang had asked Viking’s son Ryan Calcote (Nicholas Holmes) to help him in his fantasy football league. Ryan pointed out Mustang had three players from the same team on his roster. Mustang told him he was loyal to his home team. Later, a football game is being played on television. Mustang cheers the Baltimore Ravens. Ryan is confused by this. Mustang then tells him that loyalty comes at a cost. Little does Mustang know how much his loyalty to Viking will cost him. Whenever you’re loyal to someone, there is a cost involved. The cost isn’t necessarily a bad thing. The cost associated with loyalty is often a fair price. However, you may pay a hefty price for loyalty. Especially to a bad leader. Who taught you your ethics? A hitman who went by the name of Eskimo (Arnold Pinnock) sold information to Viking. Eskimo had been hired by Nels to take out Viking. Instead, he sold out who hired him to Viking. Viking didn’t take too kindly to this. He believed Eskimo was lacking in the ethics department. Because of this, Eskimo was dispatched. Ethics are important. Without ethics, you cannot be trusted to lead. Ethics should be considered your lifeblood. Don’t be an unethical leader. Unethical leaders are impossible to follow and are generally despised. I generally enjoy Liam Neeson movies. They’re full of action and revenge. You see a man on fire and he knows what he wants. Cold Pursuit had the potential to be a great movie. Yet, Cold Pursuit fell flat for me and others. It wasn’t a “Liam Neeson” movie even though the plot felt like it should have been. Know you will try new things or add a twist to old things. When you change what you’re doing, you may leave your old fans feeling disappointed. This can be good and bad. Not everything you will do will resonate with everyone. That’s okay. Find your audience. Then serve them well. Question: Have you seen Cold Pursuit? If you have, what leadership lessons did you take away from the movie? 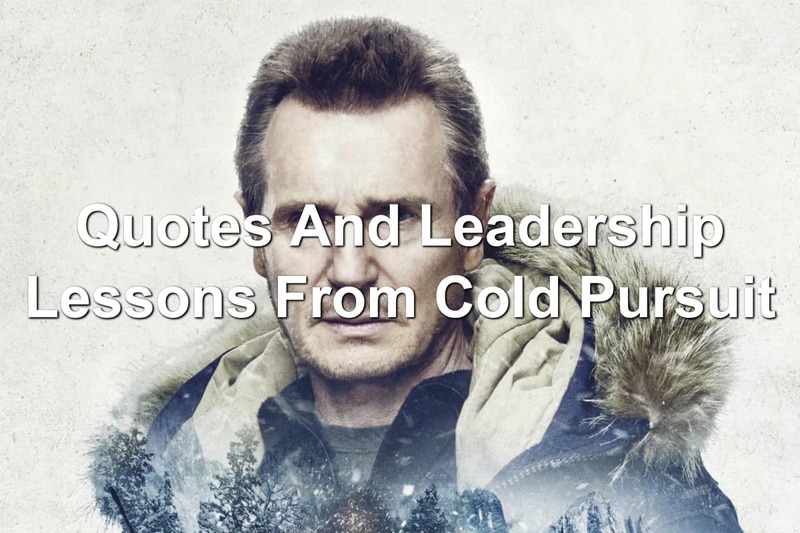 If you haven’t seen the movie, what Reel Leadership lessons from Cold Pursuit that I shared resonated with you? Share your thoughts in the comment section below.